Mercedes-Benz launched the E-Class Long-Wheelbase in the Indian market on February 28. It was introduced in two variants the E 200 and the E 350d, priced at Rs 56.15 lakh and Rs 69.47 lakh respectively (both prices ex-showroom Mumbai). However, now the German automaker is introducing a new variant of the E-Class LWB, the E 220d, on June 2. The E 220d will be placed between the E 200 and the E 350d and is likely to be priced around Rs 60 lakh mark. Instead of the older 2.1-litre engine which was present in the last-generation E-Class, the new E 220d will come with Mercedes’ new 2.0-litre, four-cylinder diesel engine which makes around 196.7PS of power and 400Nm of torque and is coupled to a 9-speed automatic gearbox. The E 200 has a 2.0-litre petrol engine which puts out 187PS and 300Nm and helps the sedan reach 100kmph from a standstill in 8.5 seconds. However, the E 350d is the most powerful E-Class, with a 3.0-litre, V6 diesel engine which produces 262PS of power and 620Nm of torque. The E 350d can reach the 100kmph mark in just 6.6 seconds and has a top speed that is limited to 250kmph. The E 220d’s power and torque figures are likely to be between the E 200 and the E 350d. When launched, this version will be an affordable alternative for customers looking for a diesel E-Class as compared to the E 350d. The E 200 and the E 350d not only have a different engines but they also vary in features. 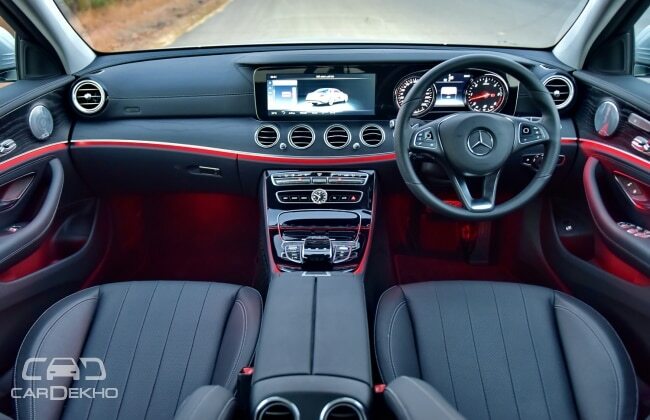 Both the variants have a massive price difference, and the E 200 misses a lot of premium features like air suspension, Burmester surround-sound system, 360-degree camera system and memory function for the driver’s seat which are offered in the E 350d. If all of these features are present in the new E 220d, it will certainly be priced on a higher side. However, we have to wait until June 2 to find out.